♦ 2/3 cup buttermilk (make your own — 2/3 cup whole milk mixed with 2 tsp white vinegar. Let sit for 10 minutes). For the Cake: Position rack in center of oven and preheat to 350° F. Butter and flour two 9×5 loaf pans. Sift together the flour, salt, and baking soda in medium bowl to blend; set aside. In a stand mixer, beat sugar and orange peel in large bowl at low speed for 1 to 2 minutes to release essential oils from peel. Add butter and beat until light, anywhere from 3 to 6 minutes. Add eggs one at a time, beating well after each addition. Slowly mix in the orange juice (mixture will look curdled). Alternate between adding the flour mixture and buttermilk, beginning and ending with the flour. Transfer batter to prepared pans; smoothing the tops. Bake until tester inserted near center comes out clean, about 45 to 50 minutes. For the glaze: Towards the last few minutes of the baking, boil orange juice, sugar, and butter in heavy small saucepan over medium heat until reduced to 1/2 cup, swirling pan occasionally, about 5 minutes. Poke holes in the warm cakes using a skewer, and brush half of the glaze over the tops. Allow to cool in pans for 10 minutes, then turn cakes onto a rack and brush with remaining glaze; cool completely. For the icing: Place sugar in small bowl. Mix in orange juice, 1 teaspoon at a time, until thick pourable consistency forms. 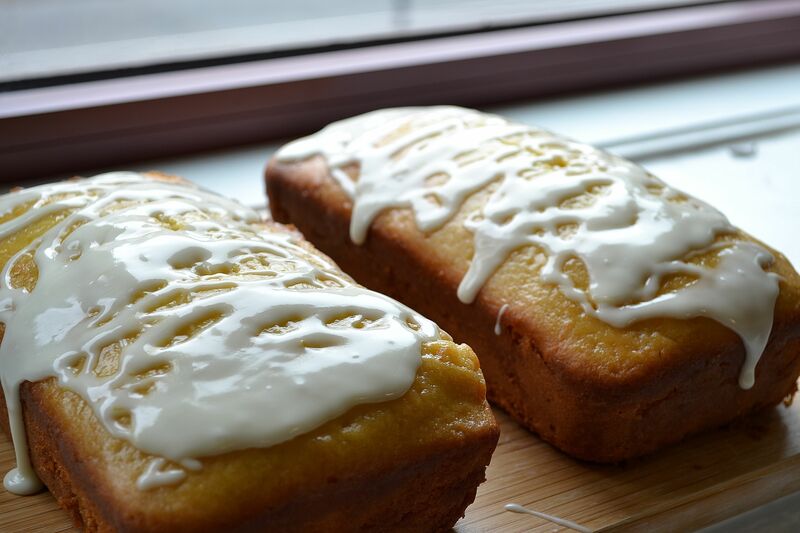 Drizzle icing over cakes. Let stand until icing sets (can be made 1 day ahead – cover and store at room temperature).